The year in our church is marked by a number of celebrations and special events. In winter, we have a Solstice celebration and bonfire. There are good food, singing, and some solemn moments also, as we reflect on the ancient meanings of the occasion. Early spring is highlighted by a sunrise service. One recent year we gathered on a hill before dawn and watched the sun rise through the mist. We then joined the United Church for breakfast after their Easter sunrise service. Two holidays are unique to Unitarian Universalism: the Flower Communion in spring, when everything is in bloom, and the Water Communion, in autumn. The Flower Communion originated in the Unitarian Church of Czechoslovakia. People bring flowers to the service, either from their own gardens or from the field or roadside. Each person places their flower in the same large vase. At the end of the service, as people leave the church, each takes a flower from the vase other than the one that they brought. The significance of the flower communion is that as no two flowers are alike, so no two people are alike, yet each has a contribution to make. Together the different flowers form a beautiful bouquet. 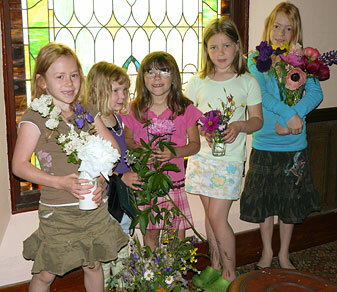 Our common bouquet would not be the same without the unique addition of each individual flower, and thus it is with our church community, it would not be the same without each and every one of us. In the Water Communion, members bring to the service a small amount of water from a place that is special to them. People one by one pour their water into a large bowl. As the water is added, the person who brought it tells why this water is special to them. The combined water is symbolic of our shared faith coming from many different sources. Services held in our historic church across from Barrett Hall in the warm months. In Barrett Hall during the colder months. Sunday, April 7, 10 a.m.
Sunday, April 21, 10 a.m.